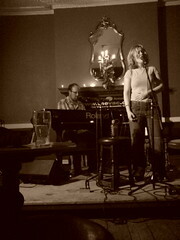 Friday night, I went out to a fabulous gig – Miriam Jones was playing at The Perseverance in London, with Jez Carr on piano, so Lo and I, along with lovely Susan went to see them. And they were, in a word, outstanding. Miriam’s amazing (check it out for yourself, she’s got a free album to download from her website) and you all know Jez is great from his playing on Conversations. Anyway, their fabulousness is not the primary reason for this post. It’s what happened when they finished that inspired this… Miriam was the middle of three acts on, all doing half hour sets. The times weren’t announced before the gig, so we turned up at around the start time, and sat through the first bloke. Not great, but not dreadful either. Having not seen Jez in months, or lovely Susan for even longer cos she lives in NYC, one of the main reasons we were there was to catch up with them. The gig was in the upstairs room of a pub, so we headed downstairs for a chat. This clearly riled the guy that was on last, whose behaviour implied that we should somehow feel obliged to stay and listen to him… We didn’t feel obliged, and didn’t stay to listen – his was a name I recognised from the circuit (the gig was put on by Freedom Of Expression), he wasn’t someone I’d had recommended to me, so didn’t feel any urgency to check him out either way. But crucially, I also didn’t feel animosity towards him either. However, at the end of his set he came down to the bar, across to where we were sat and said to Miriam, curtly, ‘I enjoyed your set, shame you couldn’t be bothered to listen to mine’. OWN GOAL!!! With that one sentence he pretty much guaranteed that no-one at that table would EVER bother to go and see him play. Before that line, we’d have all probably checked him out next time as a name we were familiar with. After it he was put in the box marked ‘miserable shitheads’, not to be bothered with. His problem was assuming that his music ought to be at the top of the priority list of people who know nothing about him. People who all had VERY good reasons to not listen to him on that night. People who if they had been forced to sit through a set instead of chatting would have ended up resenting him, and certainly wouldn’t be predisposed to liking what he did. People who, if he’d left them alone may well have stuck around to see him next time. Look, there’s always a load of great reasons for someone not watching you play, for them not turning up early enough to see your support slot, for not sticking around to see you play last, for not coming to your show, for missing your bit on the radio… Nobody owes you their attention. Attention is a currency we trade in. We earn it, we should respect and appreciate it, and we shouldn’t ever get upset when live music isn’t at the top of someone’s priority list. Maybe it’s part of the artistic temperament to be utterly self-absorbed, but it’s a tendency we HAVE to get away from, or we end up doing what sh’teed did on Friday night and actively turning future potential fans off from ever wanting to hear us. If we’d sat at the back of the venue and chatted, he’d have had reason to be annoyed. That’s just rude, and it spoils it for everyone else. But the simple equation is it’s way better to play to 5 people who REALLY WANT TO BE THERE, than to 30/50/100/whatever who are there out of some misplaced sense of obligation or etiquette and really want to be elsewhere.